With the rapid development of modern industry, our lifestyle and the surrounding environment have undergone major changes. More and more, people are beginning to look for a more natural and simple lifestyle. 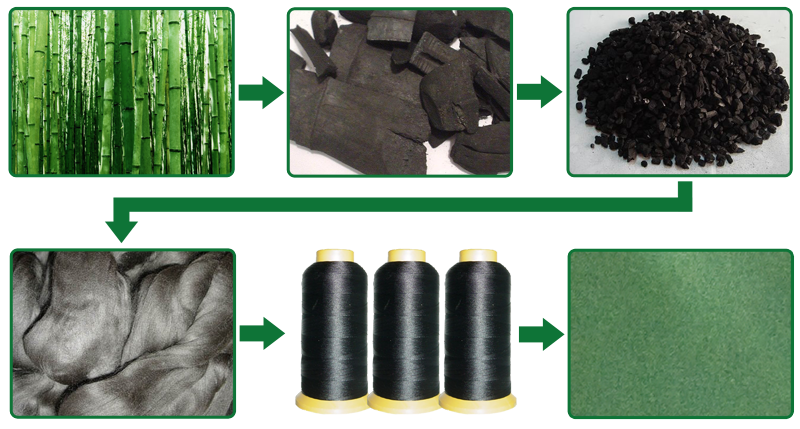 For this reason, the search for a natural and eco-friendly fibres is intensifying, and among these a fibre derived from bamboo carbon, als known as “Black Diamond”, has been developed. The bamboo plant used in this process must be at least 6 years old. An innovative technology using pure oxygen at high temperatures is employed. In this way, an extraordinary fibre is created, eith a honeycomb structure formed by lines that branch outwards from the inside. Anion Generator: in the academic world, Bamboo Charcoal Fibre is known as the “Air Vitamin”. It can release 2600 anions per cubic cm. Anions are known to bring well-being to our body. For example, they activate cells by purifying blood, freeing us from fatigue, relaxing the vegetative nervous system and improving allergy resistance. Our skin can absorb 82% of negative ions, therefore using the bamboo charcoal textile increases anions which help improve our health. High absorption and deodorization capacity: the lines that make the fibre honeycomb structure increase its surface. This improves both the absorption of all types of chemical substances present in the air, such as formaldehyde, benzene, ammonia and so on, as well as strong odours and smoke, thereby helping to remove them. Moisture management: the special honeycomb structure and fine bamboo charcoal patterns can quickly absorb moisture, dispersing it and thus ensuring our body stays fresh and dry. This fibre is particularly suitable for fabrics such as sheets and blankets. Resistance to bacteria and mould: Results from analysis carried out by the Test Center of Antimicrobial Materials Technical Institute of Physics and Chemistry, Chinese Academy of of Sciences and Zhejiang Province Microbial Institute, show that antimicrobial activity obtains Grade AAA of F2/ T73023-2005 and that mould resistance of 100% bamboo charcoal knitted fabric (30s/1) can obtain GradeI in 14 days. Anti-pilling and anti-fuzzing: The fabric created from the fibre is Grade 4-4, 5. Easy dyeing: Normal ECDP temperatures and pressures are used. Temperature dyeing from 82°C – 100°C; this fibre can be dyed with dark and brilliant colors. The speed of color absorption can be above Grade 4. Lasting effect: Quick drying after washing and long-term maintenance of properties, regardless of the quantity and quality of washing. Applications: This fibre has a wide usage, and can be manipulated as a single thread or mixed with cotton, wool, silk, linen, and other fibres including synthetic ones. End use: Pillows, blankets, bedding, mattresses, weft, clothing for medical purposes, for children and mums-to-be, towels ,socks, underwear, furnishing fabrics, fabric interiors for both cars and boats, and more.